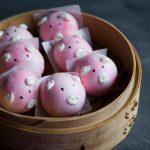 Soft fluffy steamed buns are lightly sweetened and made into little piggies are sure to steal everyone's heart. Making them is as fun as eating them. You can also use 255 gr all-purpose flour + 45 gr cornstarch if you don't have cake flour. The texture is not really the same. Both are soft, but using cake flour has an even softer cake-like texture, which I like.